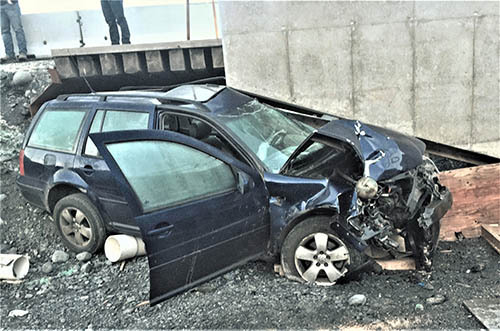 Recent work zone crash on the Seward Highway. (JUNEAU, Alaska) – The end of winter across Alaska signals the start of Alaska’s other season – construction season! Warm temperatures mean that construction season is kicking off early across the state, and the Alaska Department of Transportation and Public Facilities (DOT&PF) is reminding drivers to drive with caution in work zones. This week DOT&PF joins other DOTs around the nation to celebrate National Work Zone Awareness Week April 8-12, 2019. In the past two weeks there have been three serious crashes in work zones in Alaska. On average, there are over 120 highway work zone crashes each year in Alaska. DOT&PF reminds drivers to stay alert and be cautious when driving through work zones by minimizing distractions, following signs and flaggers, and reducing speeds. To view active construction projects, visit www.AlaskaNavigator.org. When planning travel on Alaska highways, visit 511.Alaska.Gov. The Alaska 511 system is also available for drivers by dialing 511, following @alaska511 on Twitter or on Facebook at www.Facebook.com/Alaska511. The system provides statewide road condition information, including road closures, alerts to emergency incidences, weather conditions affecting travelers and AMBER Alerts.